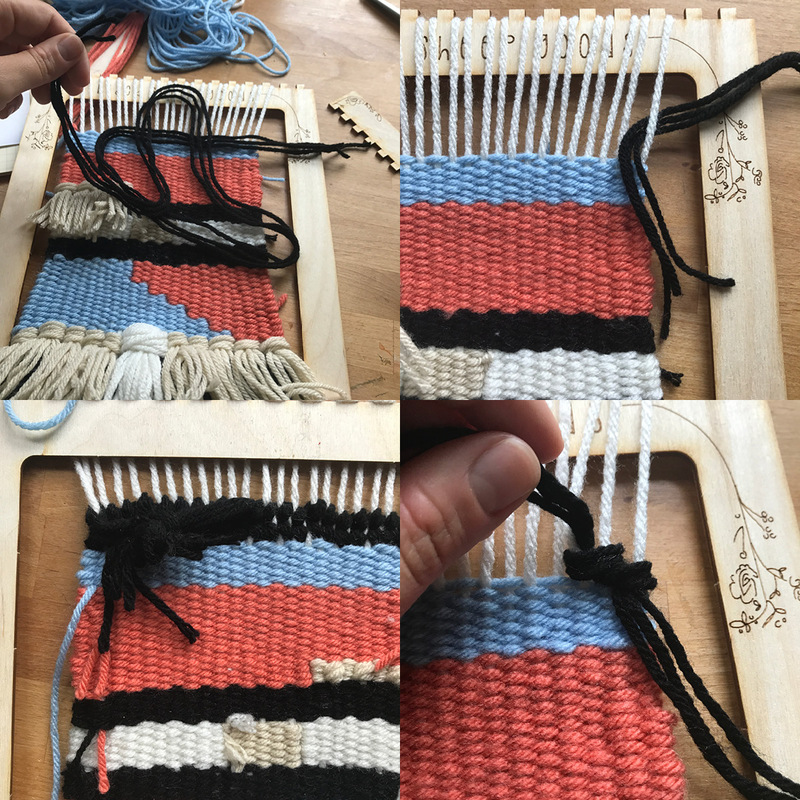 There is something wonderful about weaving. It’s quiet, repetitive. It’s a way to physically force yourself to be in the moment- a tangible mindfulness. This is true for many fiber arts. There’s also the history factor, people learned these techniques long, long ago and they have been passed down generation to generation. 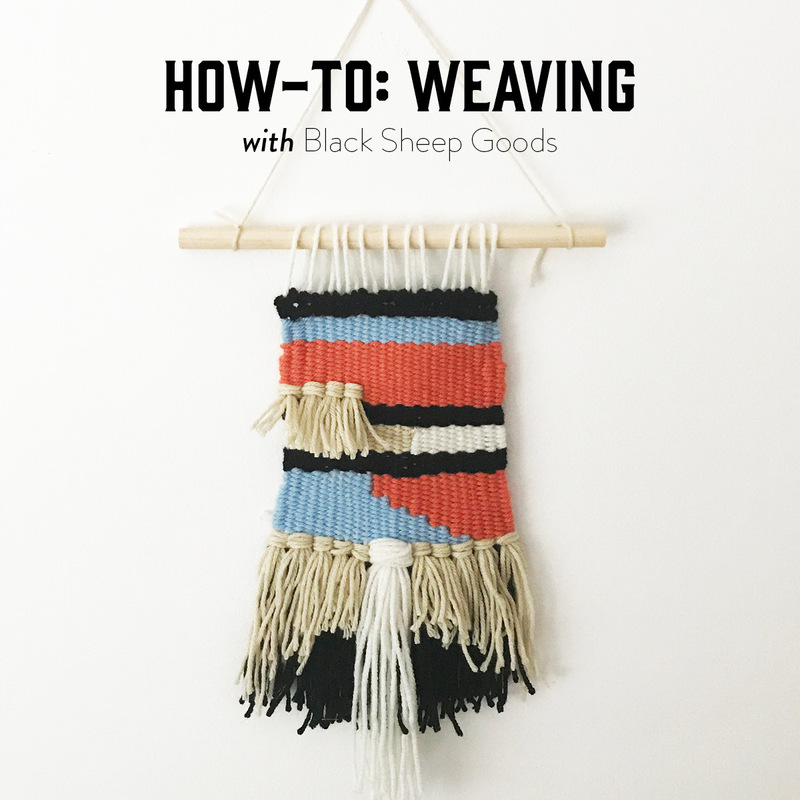 Black Sheep Goods has found the perfect way to continue passing on this tradition with their affordable at home weaving kits, instructions included! Although these kits are meant for beginners, after taking a look at the instructions I knew it would be really helpful to have a more in-depth visual guide through the process. So that’s what I aim to do! 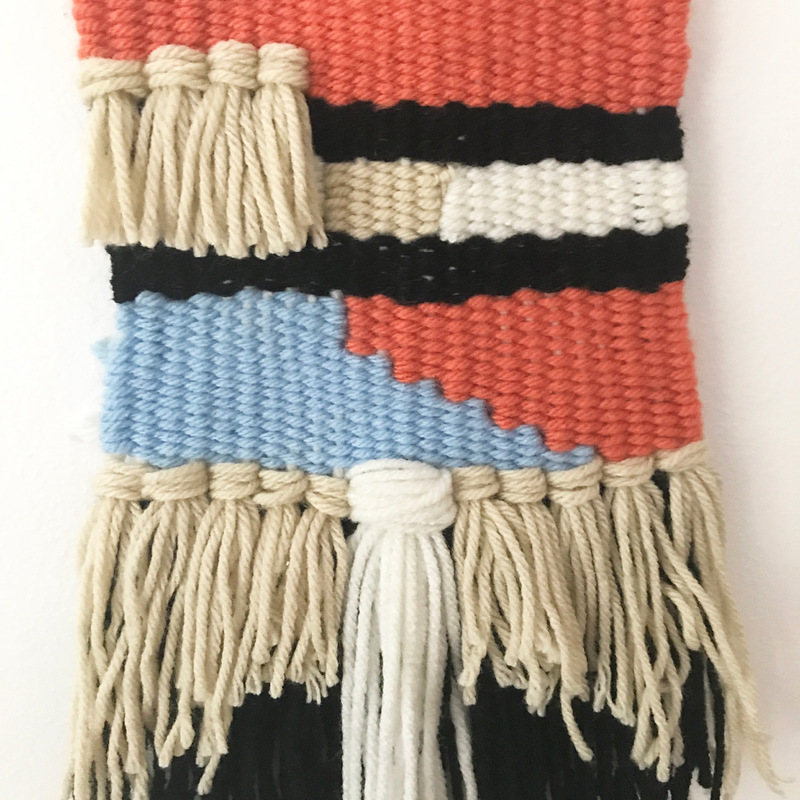 And I’ll add that although I did some weaving on a loom in college, this is my first wall hanging and I won’t tell you how long ago college was. Here’s everything that comes in the kit. Here is peek at the instructions that come with it. Those “tips” on the right- are crucial! Read through them all CAREFULLY before you even begin. To start, I punched out all of the loom pieces from the main board. The kit comes with a piece of sand paper in case of any uneven breakage, but I found mine came apart easily and cleanly. Next, I made a plan in my handy-dandy gridded notebook. It was hard to do, and I had anxiety about running out of any given color, so I left it sort of unfinished. As I worked, I found I preferred to just go with the flow anyways. 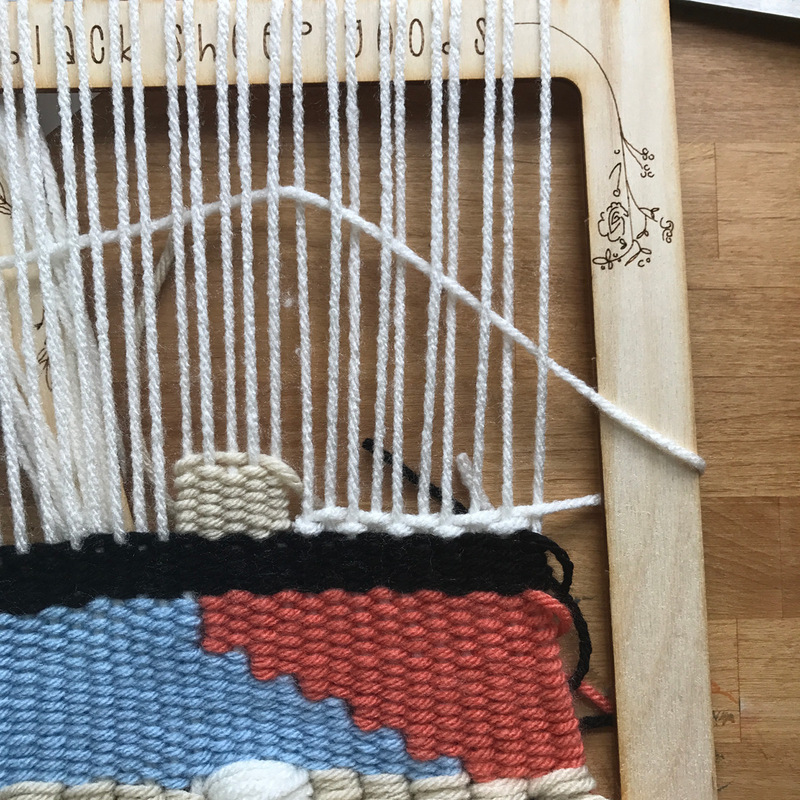 Also, I didn’t think of this at the time, but realized you could make your wall hanging any width, not just the entire width of the loom. If you wanted it more narrow, you would just use less threads. Also, it’s important to make these terms clear before starting. 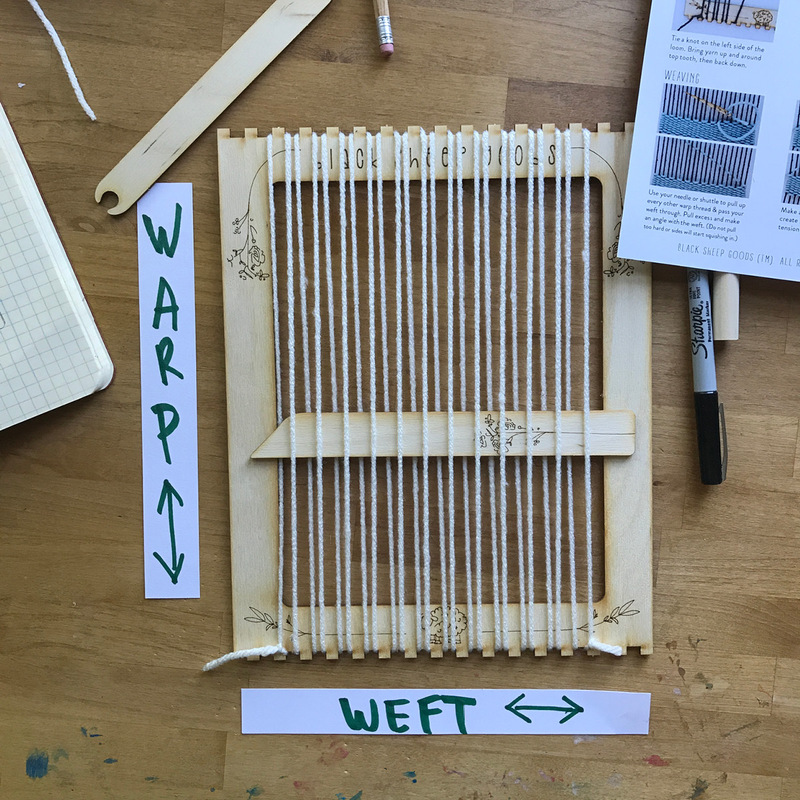 The warp threads are the original threads running N/S, the weft are the ones you are weaving into them, running E/W. I did not make these little signs for you, although they work well for this picture, I made them for myself and referenced them the whole time I was working. It was really helpful and I totally have it memorized now (maybe). 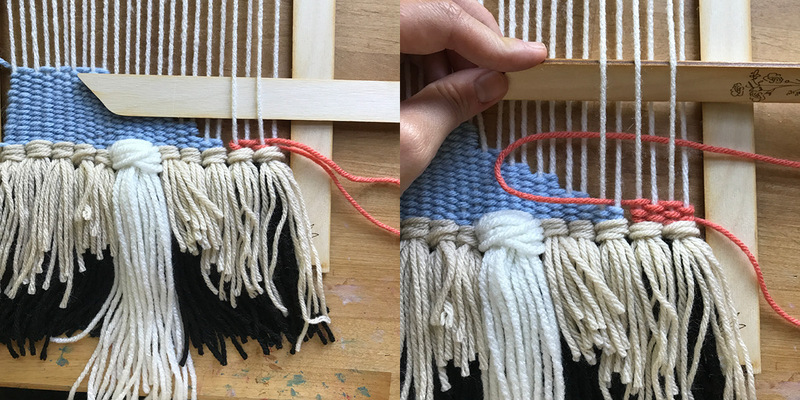 Weaving on the warp of the loom is pretty straightforward, up and down, up and down, tying off at the beginning and end. This little guy here is your shuttle. 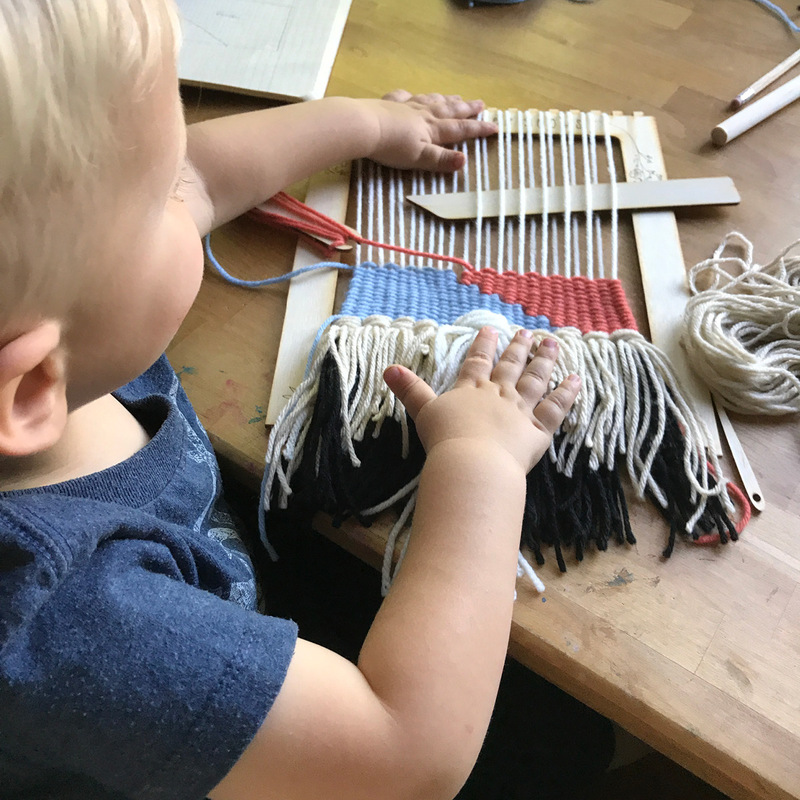 You’ll need to wind him up with the same color you used for the warp, because you’ll start your weaving with at least four rows of weaving before adding tassels (called rya) which are pretty much non-optional for the bottoms of decorative weavings. 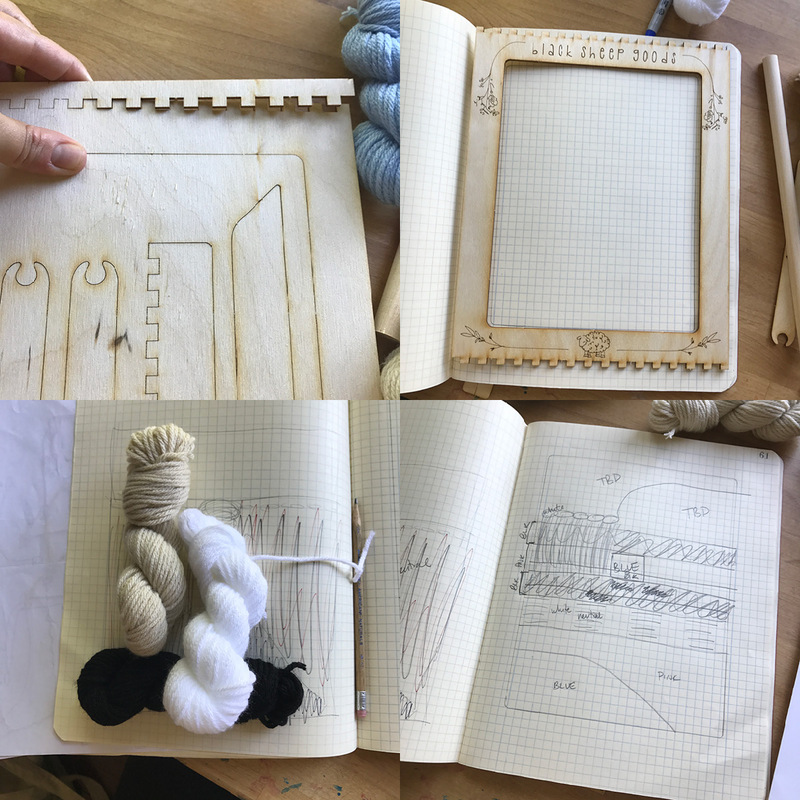 To wind the shuttle, tie the end of the yarn to the end, then make a figure 8 on the side, turn the shuttle and make another figure 8 on the other side, and so on. Do this several times, then cut ‘er loose. Next, pick up every other thread using the pickup stick. If you tilt the stick just a bit, you’ll have a little cave to pass the shuttle through. After your first pass (going either direction) leave a four inch tail at the end and remove the pickup stick. Pick up the alternate threads you did the first time, and pass the shuttle back through again. 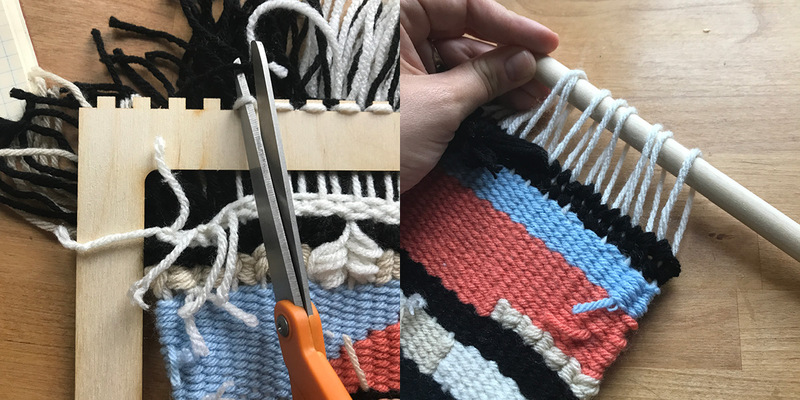 It’s okay to leave the thread in sort of an arc shape, this will help you leave enough slack, and you can use the comb to push the threads down so they lay evenly. I combed mine down after every pass, but I think you could probably go 2 or 3 passes before doing so, which would also help keep your warp threads from getting as fuzzy as mine did. 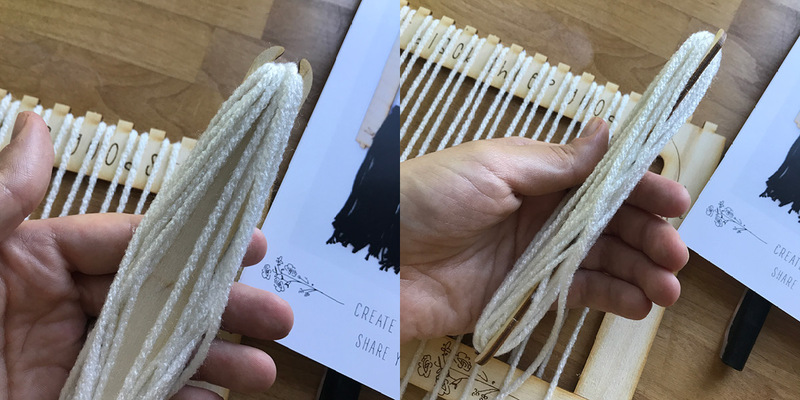 You could also skip the pickup stick and just use the shuttle itself to weave back and forth through the threads if you find this easier. Just remember to pick up the alternate threads for each pass, or you’ll undo your work. After you’ve done the first four rows, just cut off the thread leaving about 4 inches as you did in the beginning. This is what you’ll do as you start and end new sections. 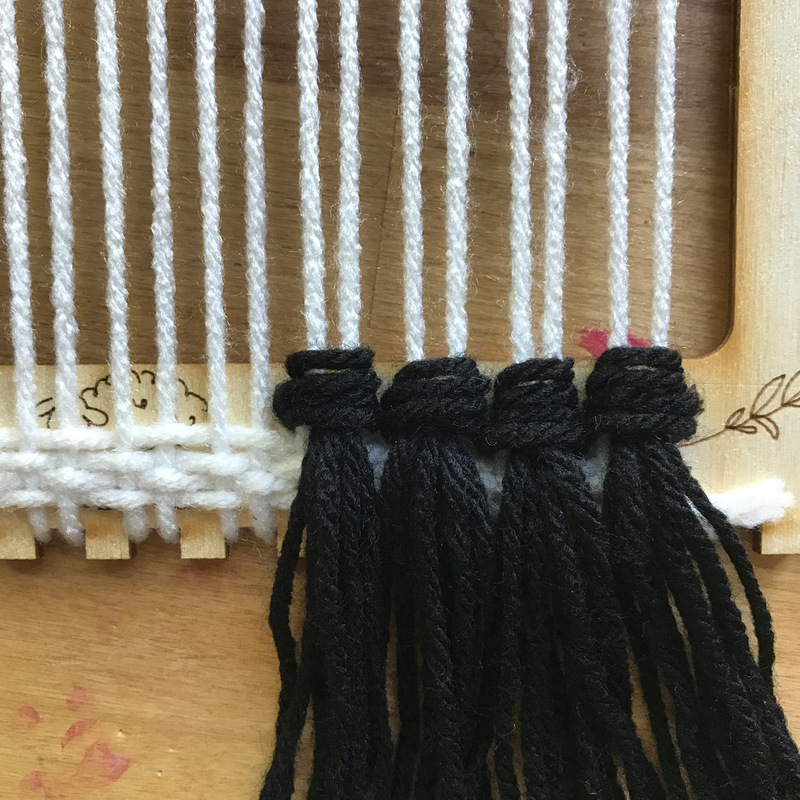 When the piece is finished, you’ll used the needle to tuck these threads into the back of the weaving. Now, tassel time! The tassels are really easy and fun (IMHO). 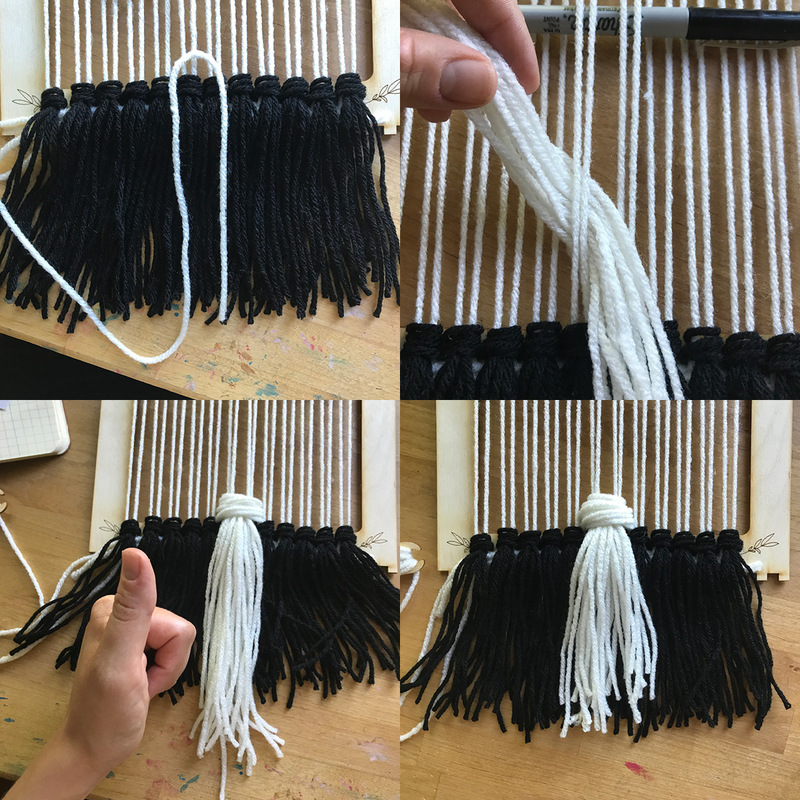 I used four threads for each tassel, which is what they show in their instruction photo. 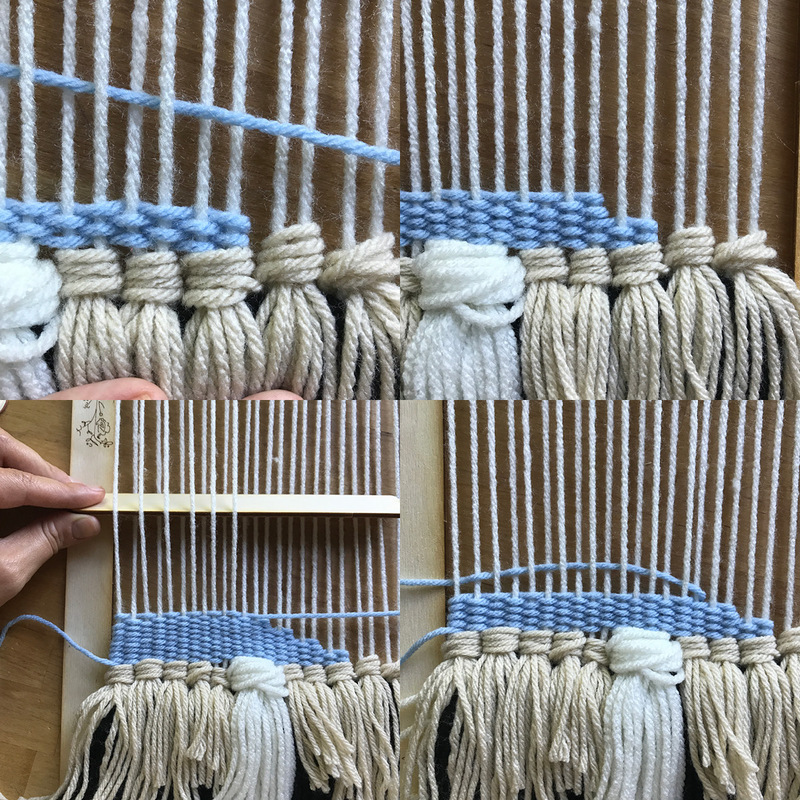 I went ahead and cut five of the same length so I would have one to measure from for the next tassel I made, since I want this row to be of even length. That being said, its okay if tassel ends aren’t even, or if they are too long. You can always trim them at the end. 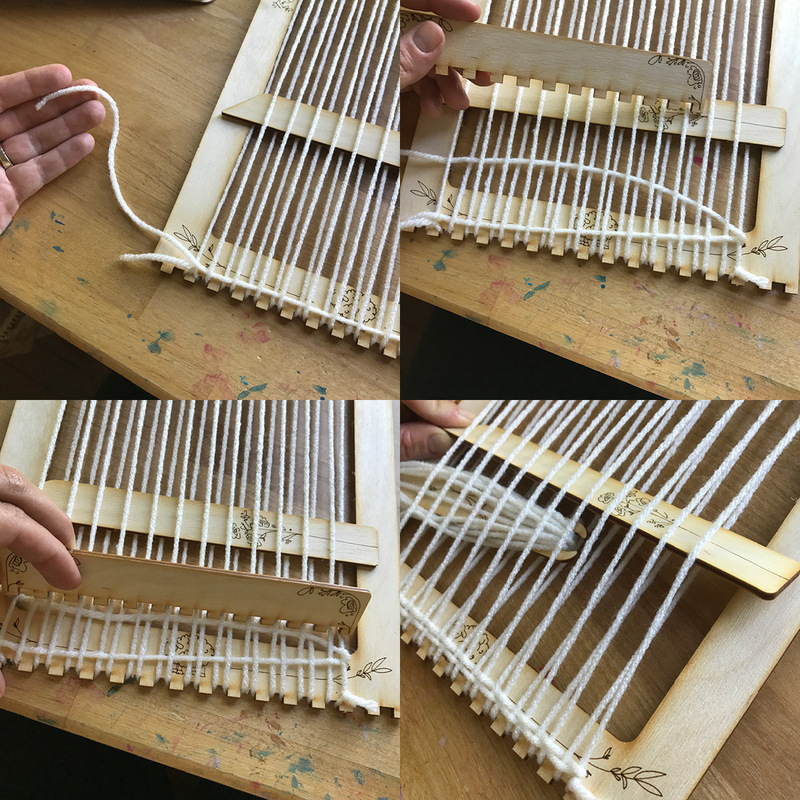 Follow the process pictured above, and in the last step be sure not to pull too tight, the two warp threads your tying onto shouldn’t pull together. 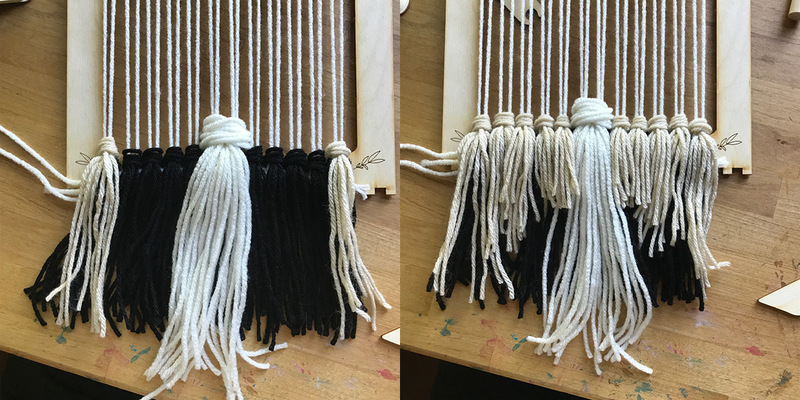 For the large center tassel, I measured out the length (first photo). I used twice as many threads as the small tassels (eight). The first tassel turned out too short (bottom right), so I made a much longer one. Now for MORE tassels. 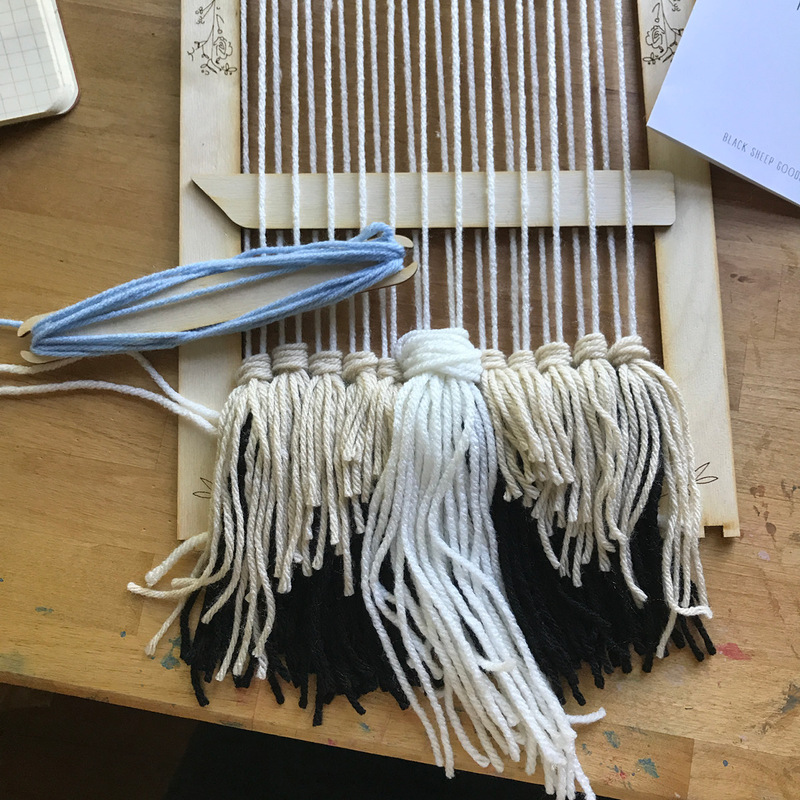 I started on the outer edges and moved into the middle, cutting an extra length of tassel thread for each set, then chopped off about an inch from that extra and measured out the next size of tassel. I did the two inner sets the same size. At this point I’m dying to trim the ends and even it all out, but I think this will be easier while its hanging, so I wait. Now for some color. According to my pattern, I thread up the shuttle with some blue thread. I visualize how far across I want the blue to go, that’s how far I feed the shuttle through, and then I just turn it around. I go two rows, then decrease the warp threads by two and weave two more rows. I keep going until its as high as I like. And now for the pink! As I mentioned before, be careful with thread tension. Don’t pull too tight! 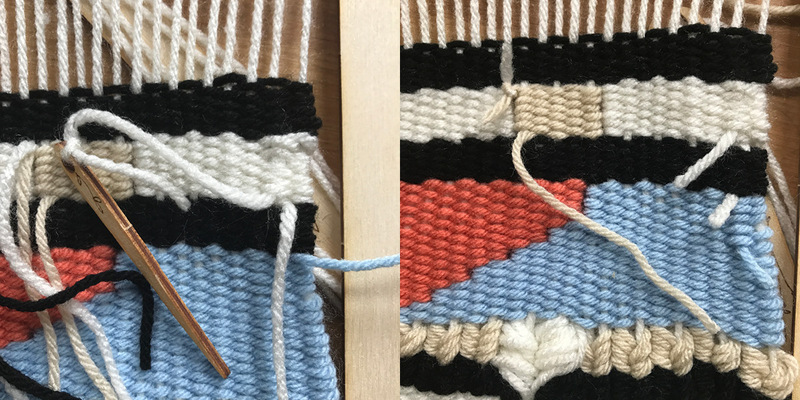 You don’t want the sides pulling in on you, and these two color blocks will pull away from each other if you weave too tight. Finished the pink and got a little visitor. “Are you making a broom, mom?” Good guess! I do a block of black, then start on the little beige square. For this section, I count the warp threads to find the middle, and just cut a length of beige to use with the needle. Tie the string to the end of the needle (it WILL slip out!) 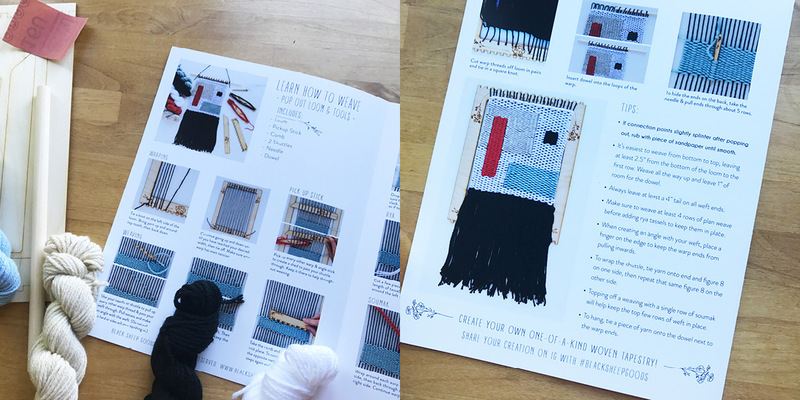 and do a small block of weaving. I make a WEE mistake while doing the blocks of white on either side. Ahem. 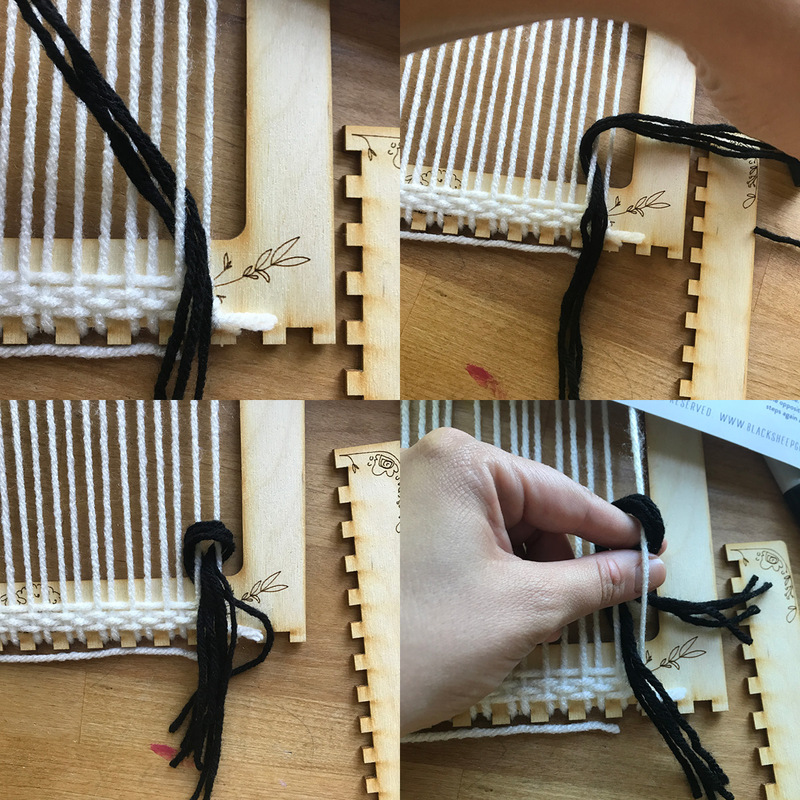 Don’t weave your weaving to the frame. After adding another block of black, I decide to tuck in some of the ends in the back, which are adding up. Just tie the end of an end (ha) to the needle, and sew it underneath about 3 or four weaved loops. Then you can just trim or tie it off. More tassels! Then some pink (see how I just go right around those tassels?) and some blue on top o’ that. Now. They tell you to finish the weaving in two rows of “soumak” which is a twisty type deal. First, cut three pieces of yarn in an undisclosed length. You can see from the first photo what I used, and it was just barely long enough. 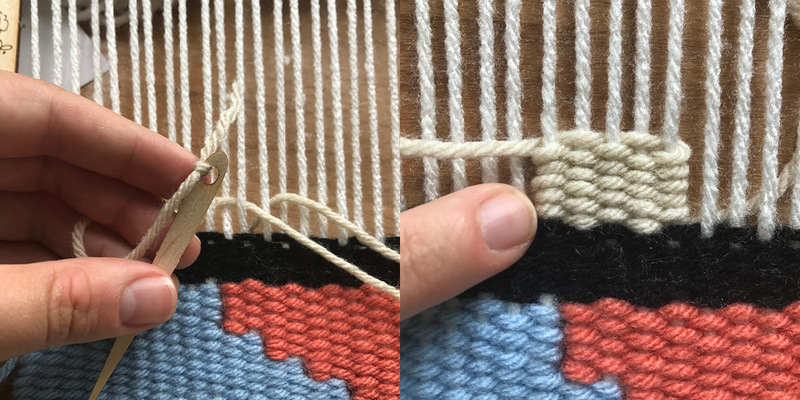 Put the end through the first pair of weft strings you’re going to start with, then wrap around over the top, to the left of the warp string, then back up through the middle of the first two again. Come back around the left side of the next pair of warp strings. Keep going until you get to the end, at which point you will switch your wrapping direction and continue the other way. I tied a knot at the end, but I can’t say I know the BEST way to do this. It turned out to be a pretty big knot. But at least you have my solidarity with this issue. Now you git ta cut ‘er loose! 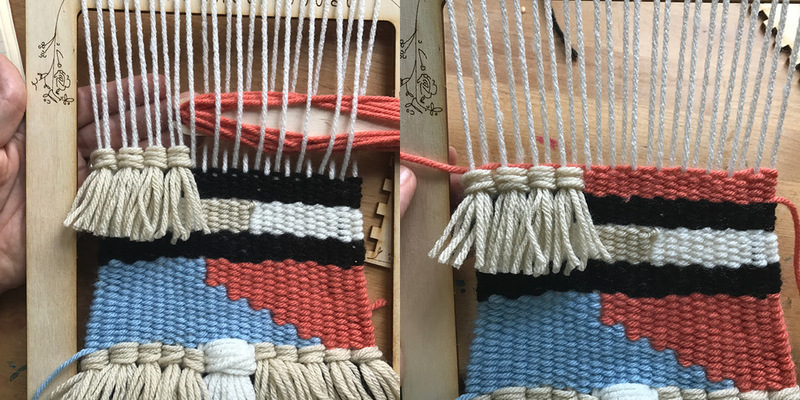 Sorry- resuming whole words… Cut the loops on the BOTTOM of your weaving, then slide the top loops off. Slide the provided dowel into the top loops, and that’s it! You’re amazing! You did it! This took me a couple different sittings to complete, about 4 total hours of work. I really enjoyed it and I think you will too! 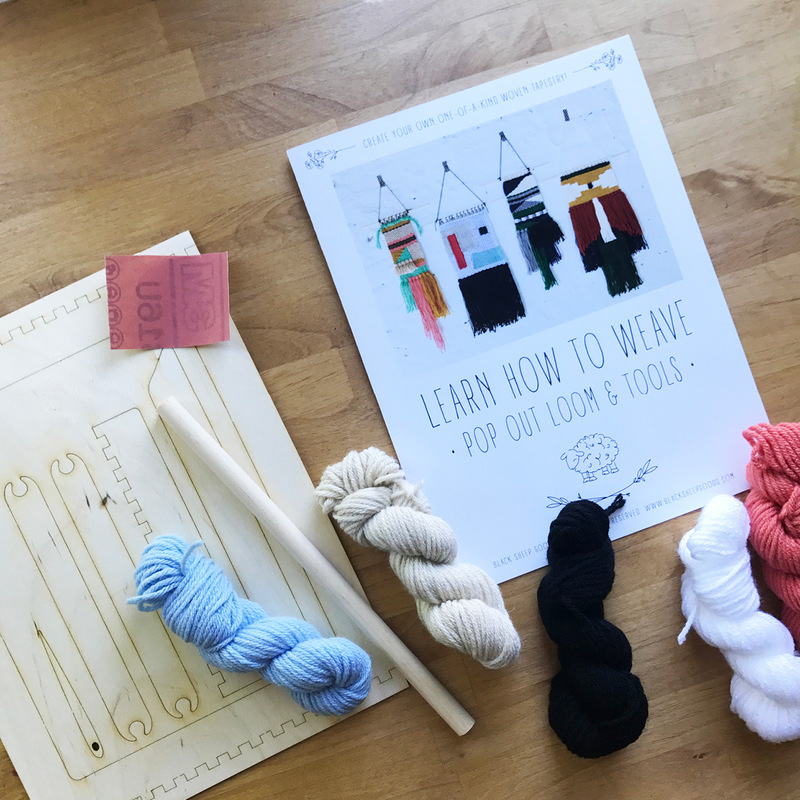 Come by and pick up a kit from Homespun, then share your photos with us! It’s almost time for the STATE FAIR! It is a highlight of the year for my family, and I’m sure you have many memories of your own. 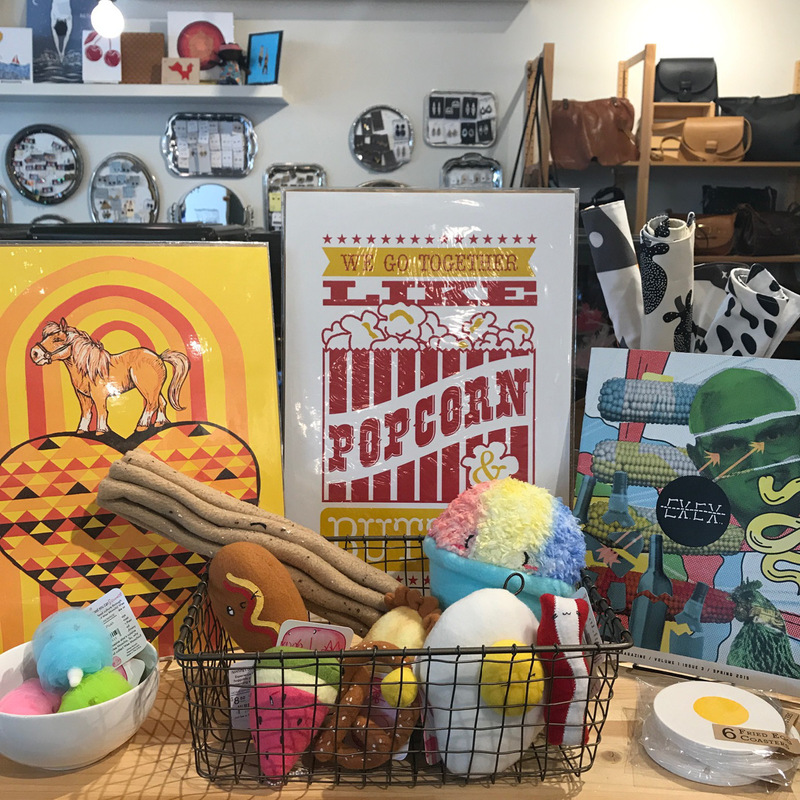 We have a slew of fair-themed items rounded up for you to enjoy and we won’t even make you shoot a target to take one home! Fair food! New from Wee Mochi. A treasure trove of wool felted garlands from Goldondrop Garlands; there are so many more colors and styles to choose from! 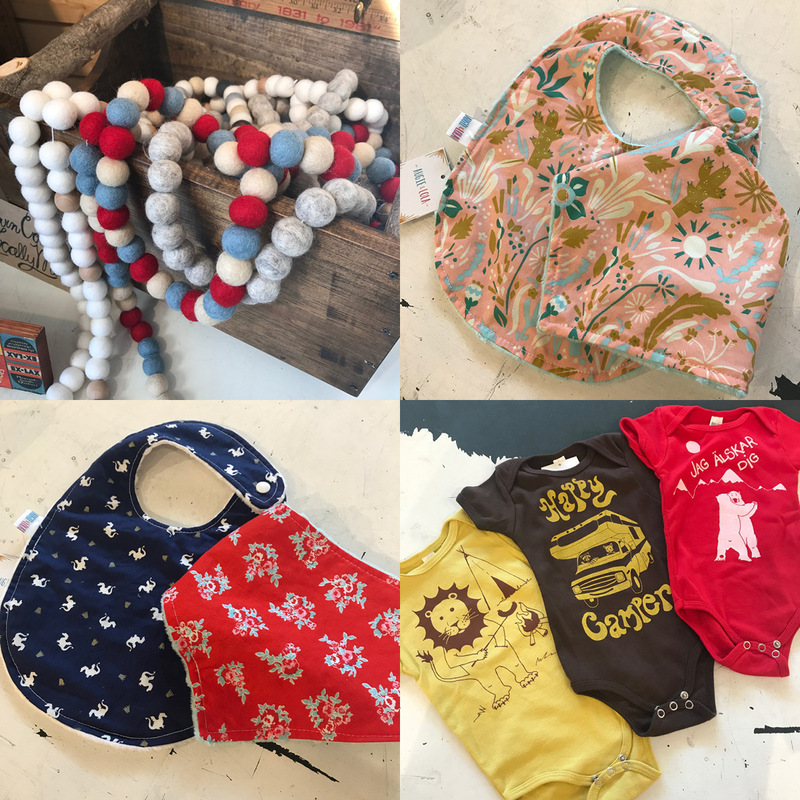 Baby bandanas and bibs re-stocked from Augie & Lola, and brand new vendor Koenig Co. brings us these outdoorsy onesies. 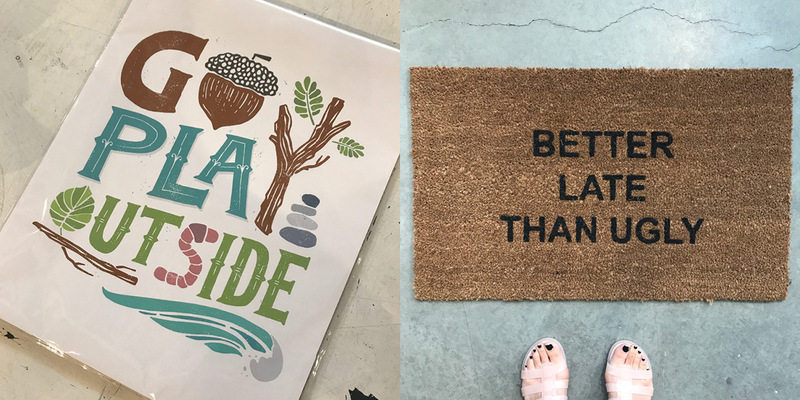 We’ve got a restock of wonderful prints from Quite Boy Studio, and I just had to show you another door mat by Laura Jane Handmade Co. ’cause it made me LOL. Heck yes. 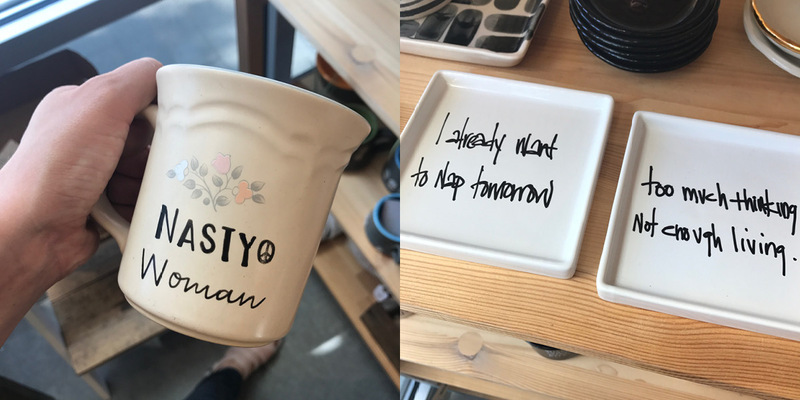 Mug by Farizula Designs, coaster/trays from Snarky. Two great fair displays and one wild, wild west. 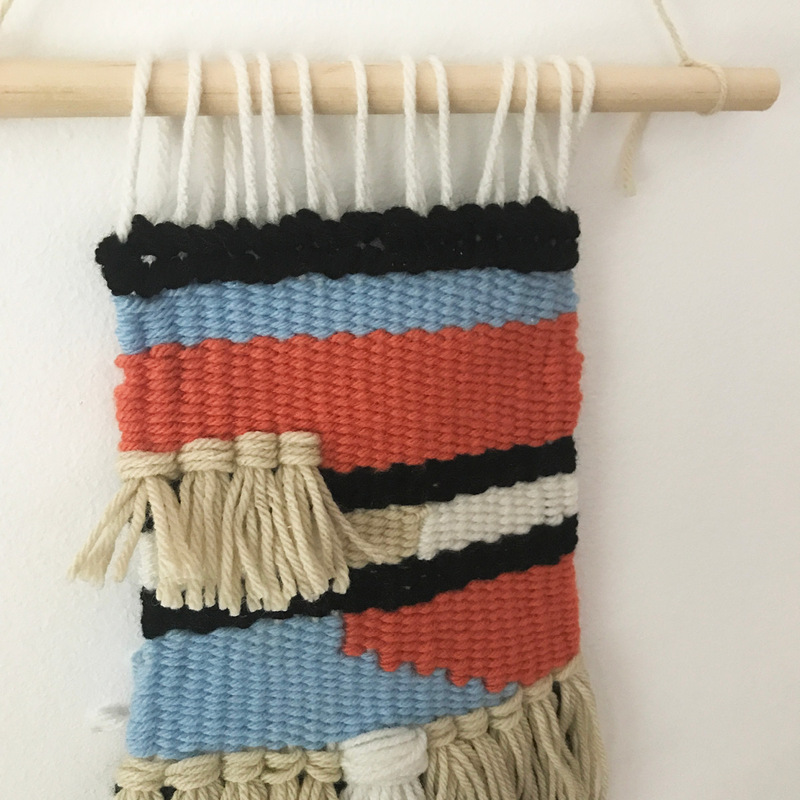 Weaving Workshop: Saturday, August 5th, 1:00-3:00pm: We’re bringing our classes back with a bang in this new Weaving Workshop from local textile artist Ribbon and Roving! – Maybe you’ve seen some of her pieces for sale in our shop! Well, Karisa, the creative hands behind Ribbon and Roving, is a long time teacher and signature cocktail aficionado (yes this class includes a boozy component). Something about the combination of care, detail, and imagination give toys from Riley Construction Toys a spark of real happiness. Looking at April’s dolls, you’re transported to your own childhood, each one could easily be a friend with unique details like glasses, hair styles, and stylish clothing. Not only are her dolls glowing with cheer, each unique stuffed toy, print, or pin carries her signature good-vibe. She also has a new business, RileyMade, for patterns and designs for the DIYer. 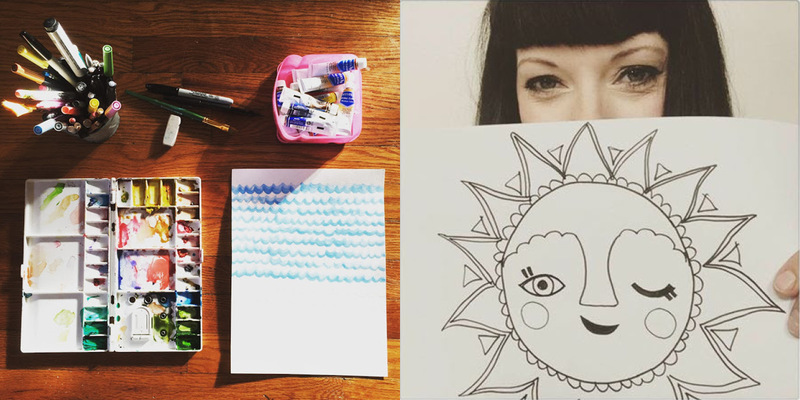 Read on to learn more about this joyful creative! 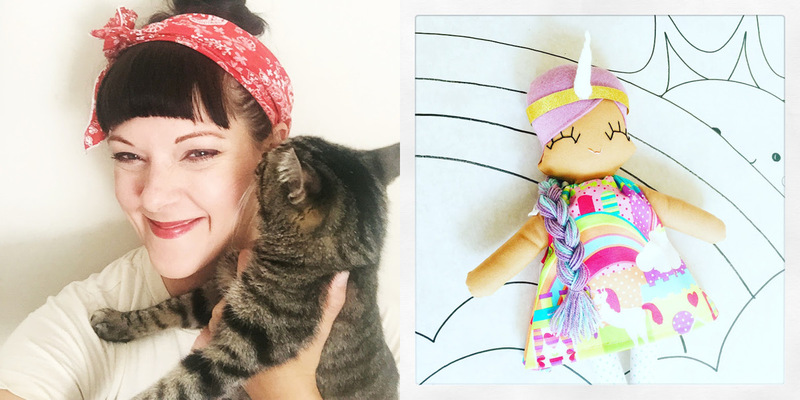 I create handmade heirloom dolls and soft plush toys that speak to the child in all of us! 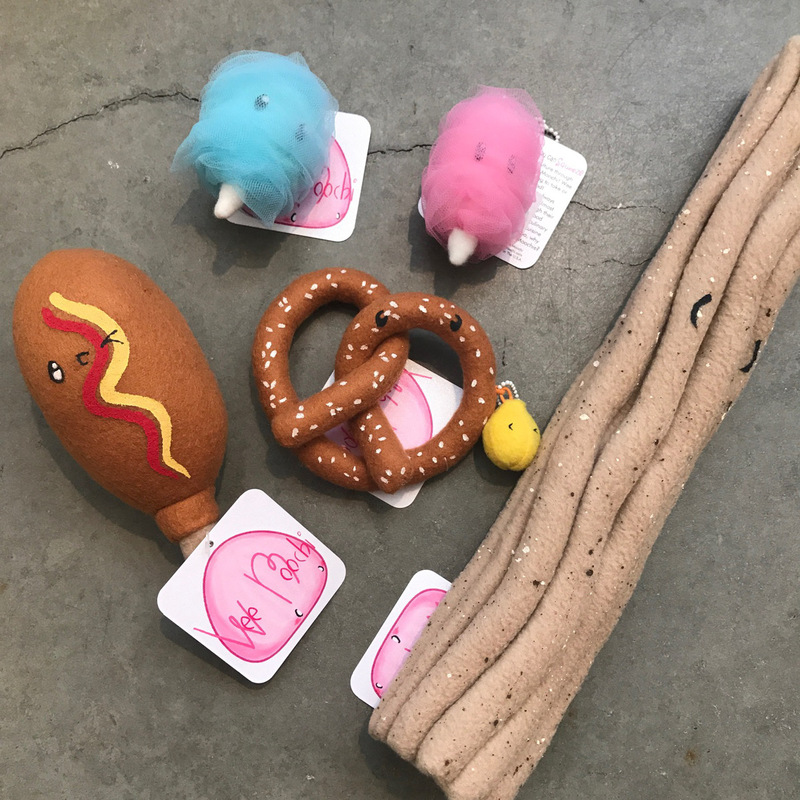 From plush campfires and s’mores to mermaid and Unicorn Girl dolls, all of my toys are imaginative, charming, and vibrant. I start by drawing and painting silly illustrations that sometimes are converted into sewing patterns and sometimes just stay illustrations. 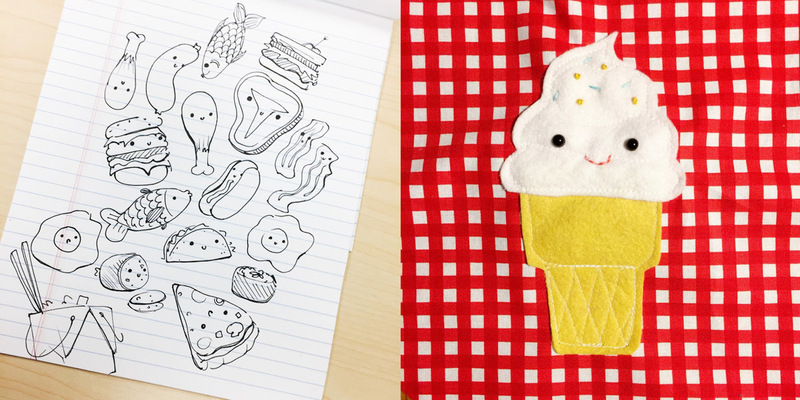 I’ve also started a line of simple plushie sewing patterns for the craft-curious. I love the way that the distance between the producer and consumer is lessened when we buy/sell handmade. Connect ions and appreciation is what it’s all about. 3| Do you ever do custom work? 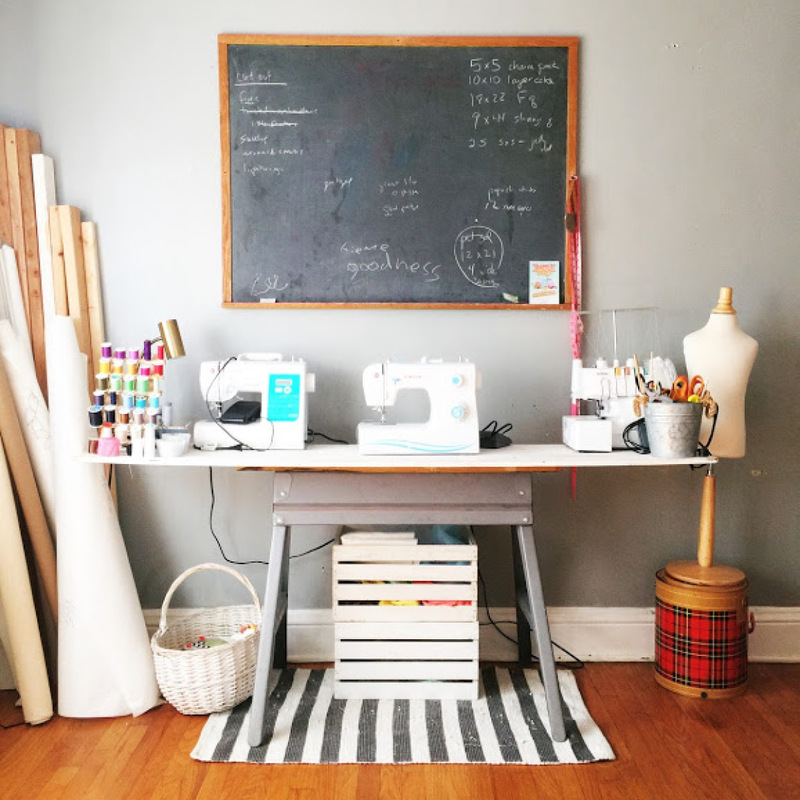 4| What encouragement would you offer to first time sewers using your patterns? Don’t stress – there are no “right” or “wrong” outcomes and your finished project will be unique to you. Don’t forget you have resources if you get stuck – YouTube is chock full of simple explanations and how-to’s. Most importantly, have fun and enjoy the simple pleasure of creating! I get to be a kid again! I love when the adults who come into my booth at an art show get excited about my work and feel, even if it’s just for a minute, like they’re kids again, playing in their blanket forts. I love when kids bond with my toys because it is supremely validating –it means I’ve found that magical formula that makes the pretend play happen and that’s an alchemy you can’t force – the magic happens when it happens. That’s hard to answer! I always wanted to make and create interesting, colorful art. I wanted to design toys when I was a kid, then I wanted to be a children’s book author and illustrator… but this was pre-internet and nobody I knew did these things for a living and I didn’t know how to start doing these things, so I just went to school and did regular people jobs instead. Somewhere in my twenties, my husband and I moved to St. Louis. 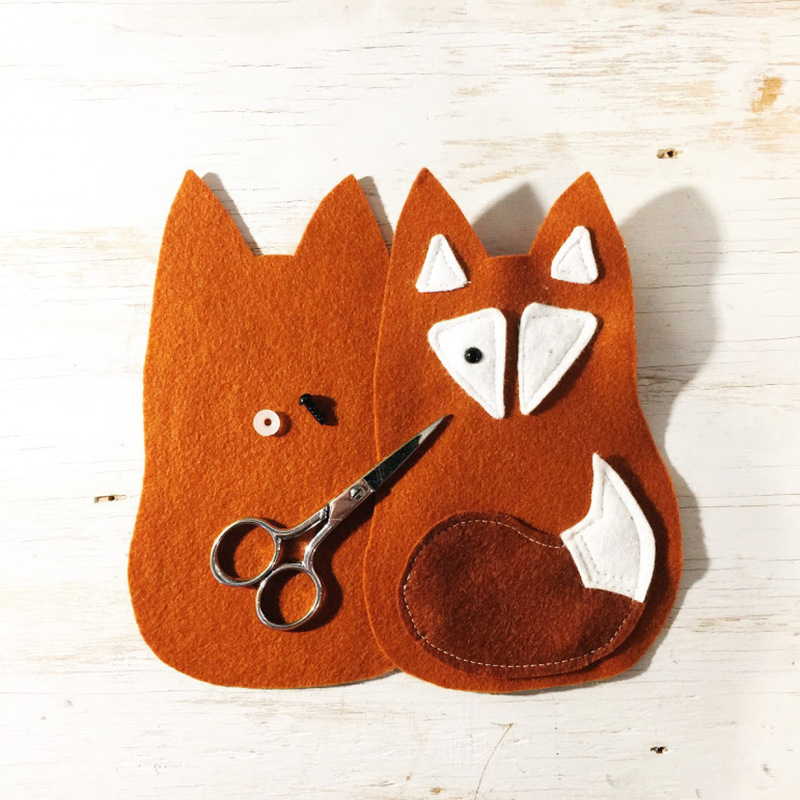 I started making accessories to sell for fun, discovered the world of indie craft online, and started a St. Louis chapter of the Craft Mafia because I knew the crafties were out there and needed to band together. 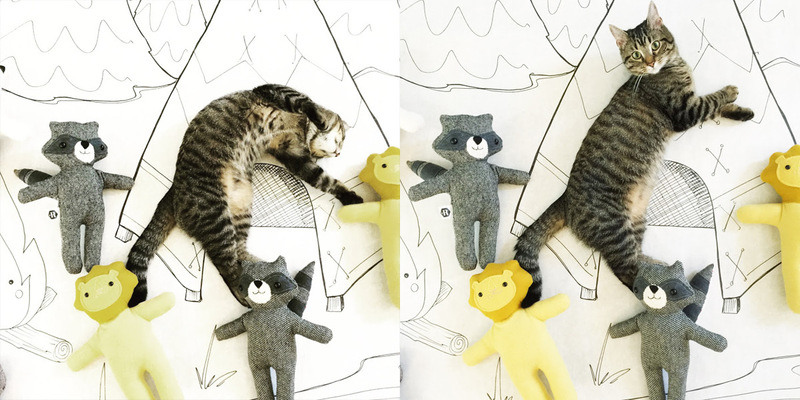 When my son was two or three, I started making some stuffed animals for fun. I’d been longing to do it but I worried that I might not be taken seriously as an artist and designer. But once I started, I couldn’t stop. I started making rag dolls about a year or two after I had been making animals and objects. The very first batch of dolls was so magical and adorable – I still have my first rag doll – that I knew I would be making them for a very long time after that. 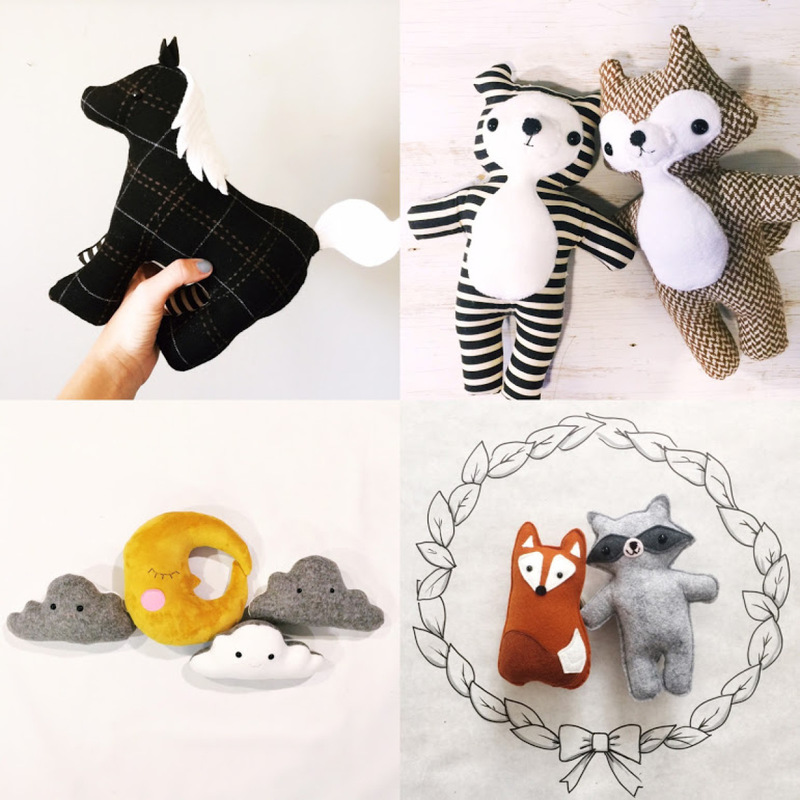 I’ve been making dolls and stuffies ever since. I have a day job, so I work on evenings and weekends. No holidays for this maker! It’s craft season all year round for me. We live in a two bedroom flat, and the “dining room” is my maker space. I’m a champion at storing my materials, tools, and inventories in a small space. 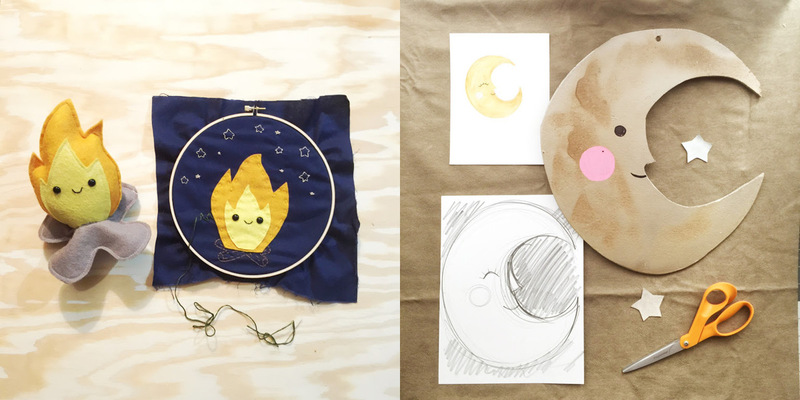 I don’t like routine so I jump into whatever process feels right and gets me in a flow – designing new patterns, tedious routine work like embroidering faces, putting in safety eyeballs, product photography, whatever suits my frame of mind. I have several different projects going at once, so I have lots of interesting tasks to choose from. I can’t work in silence, so there’s either music or Netflix happening, and there’s usually a cat or two nearby. I’m always sketching, writing notes to myself, thinking of new ideas… it’s hard to turn that channel off when I’m doing other things. I love to draw and paint and I try to incorporate those other artworks into my product photos – sometimes I draw a scene on a big sheet of paper – there is almost always a cat that wanders by and sits on the paper. 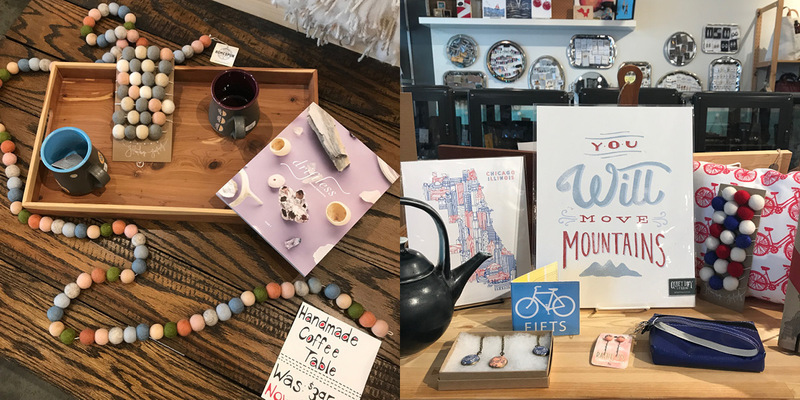 I also love to design original display pieces for craft fairs and art shows – it’s kind of like a giant grown-up version of a playhouse or blanket fort full of cute handmade props. I put my jigsaw and drill to good use in the month before a big show and I rarely use the same setup twice. It’s labor-intensive to decorate a booth or tent this way, but my philosophy is “go big or go home!” If you don’t want to be noticed or seen at an art exhibition, why else are you there? 8| Where do you go for inspiration? I’m most inspired visually – I love looking at children’s illustration and fabric design – but I’m also inspired by music. New music is like candy for me! Somewhere where those two types of sensory input intersect. I need a jumping-off point sometimes – I might have a nebulous idea that needs fleshing out so I’ll go on Pinterest or Instagram and swim through the images until I see things that start to help me tell a story and then I’m able to put my pencil to paper and start sketching. If I can fully visualize a design, I know I’m ready to move forward. Maybe a surface pattern designer – because their work has the potential to be seen in a lot of ways and because they are so prolific. 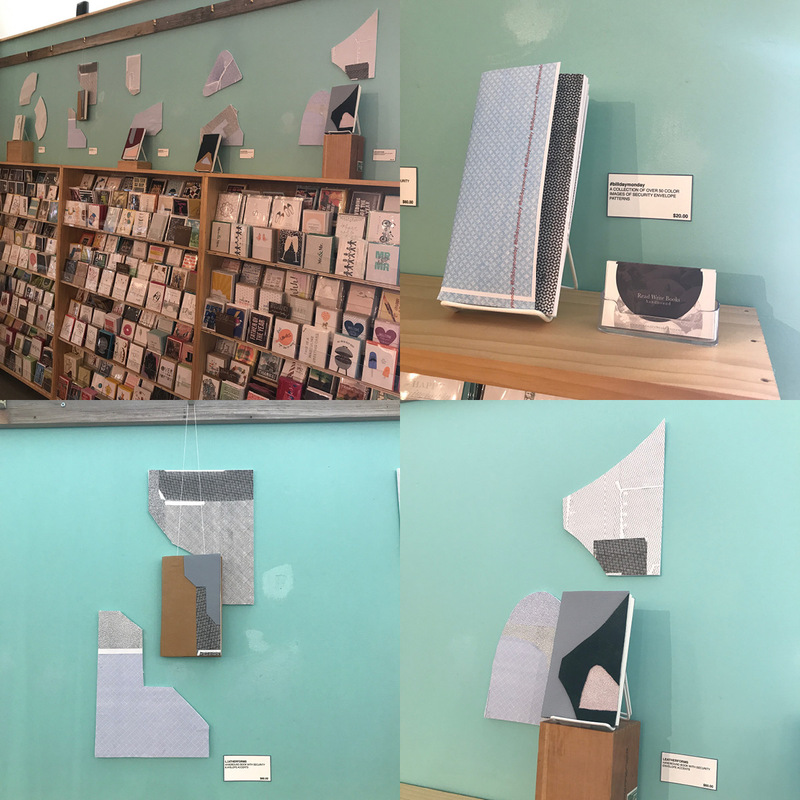 I would especially love to create multimedia artwork that is digitally manipulated to become surface patterns from the comfort of a high ceiling-ed, well-lit studio full of coffee and cats! Scarcity – the scarcity of time and materials used to create it. The feeling it evokes. Its story and its journey paired with your story and your journey. The way that a handmade object is embedded into your everyday life, not hidden away behind glass. The way it’s meant to be enjoyed and used up. My vintage Strawberry Shortcake dolls. They’re out of production, they created a lifelong love of toys and pretend play, they inspired me to create and design. I spent many happy hours playing with them, creating with them. Oh, and they still smell nice! That my childhood idols were Elvira, Mistress of the Night, and Strawberry Shortcake. Those two characters combined pretty much sum up my personality. I am equal parts silly and dark. -I write poetry, mostly for kids. I started writing poetry for kids when I was a kid, LOL. I think maybe it will end up in a self-published book of poems about weird, wonderful, angsty kids. -I have a ferret. His name is Jack Bauer. He steals dry cat food, small potatoes, and earbuds and hides them behind the curio cabinet. -I love planning indie craft shows and helping other makers tell their stories. Wanna feel like a kid again? We’ve got a whole slew of dolls in all kinds of designs that you won’t find online here at the shop. Come and check them out and get one for your favorite little- or maybe even yourself! And be sure to follow April and Riley Construction toys on Instagram, Facebook and Twitter! 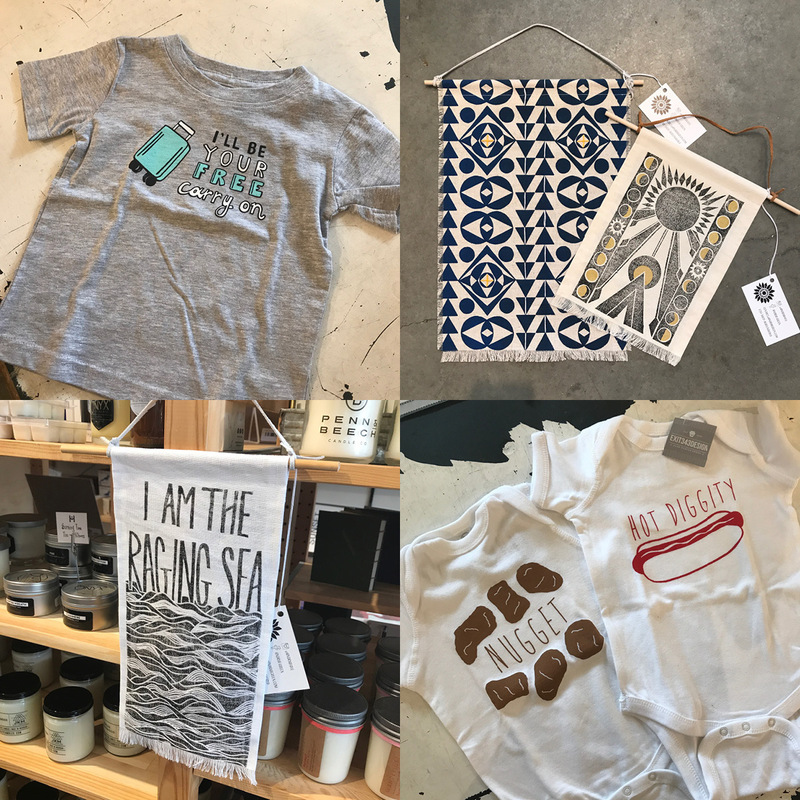 Lovely new items for you, especially if you have a little one on your gift list. 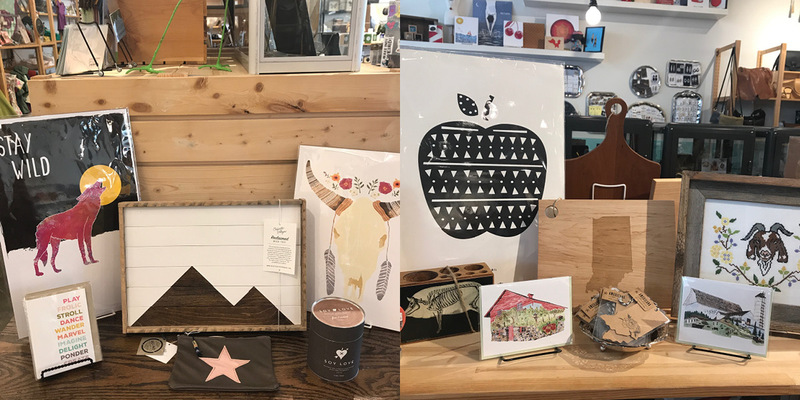 Cool down and spend some time browsing what’s new in our gallery and shop! You need this shirt if you’re traveling this summer! From new vendor Cradlemade. 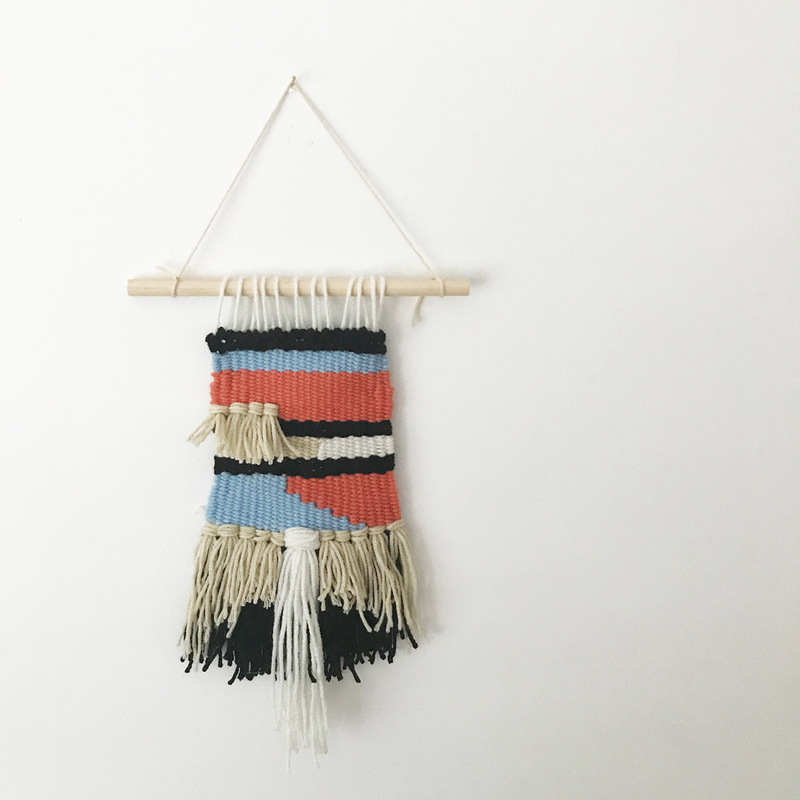 LOVE these new wall hangings from artist Andria Green. Also these little onesies from Exit 343 Design are too funny. 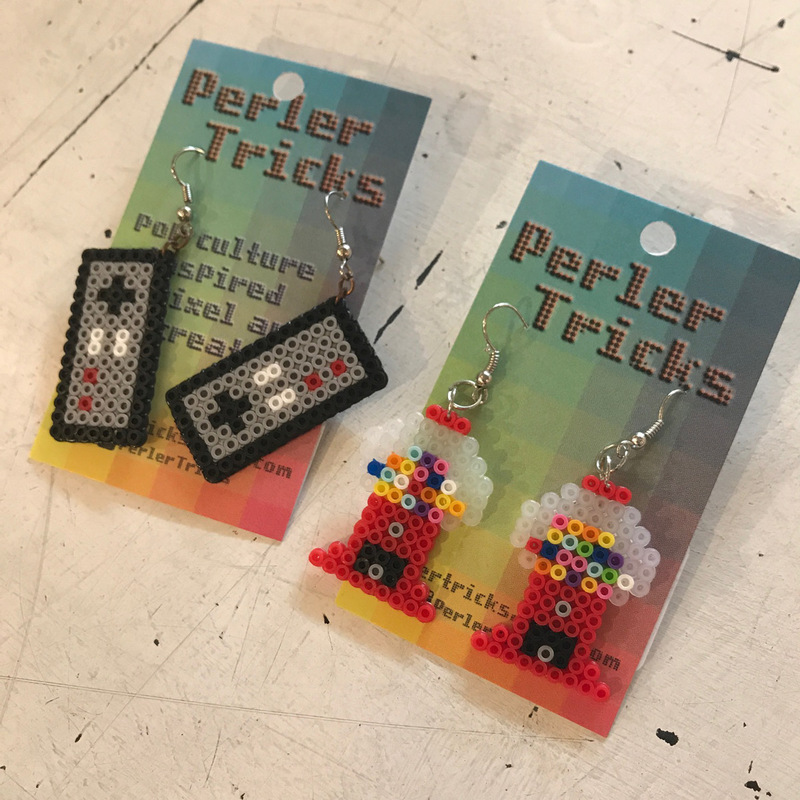 Perler beads ya’ll! These gumball machines are so perfect. Don’t forget about the cold brew coffee. This How-To post from last June is ringing true this week; the humidity is real, folks. 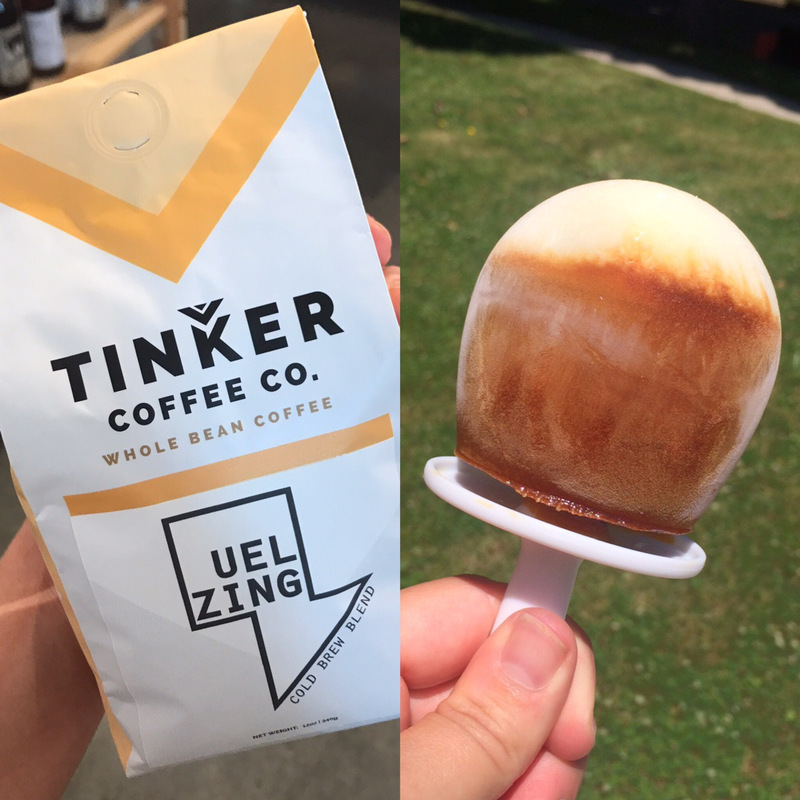 Cold brew is easy and so satisfying, read my recipes here and grab some Tinker from the shelves now. 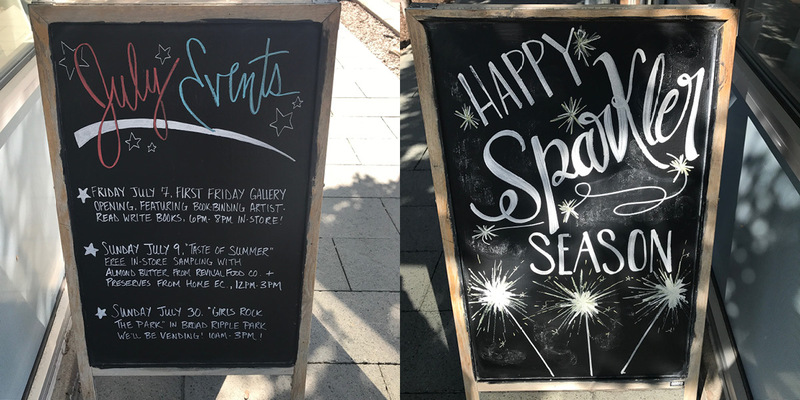 Beautiful displays by our talented staff. Brand new work by yours truly! 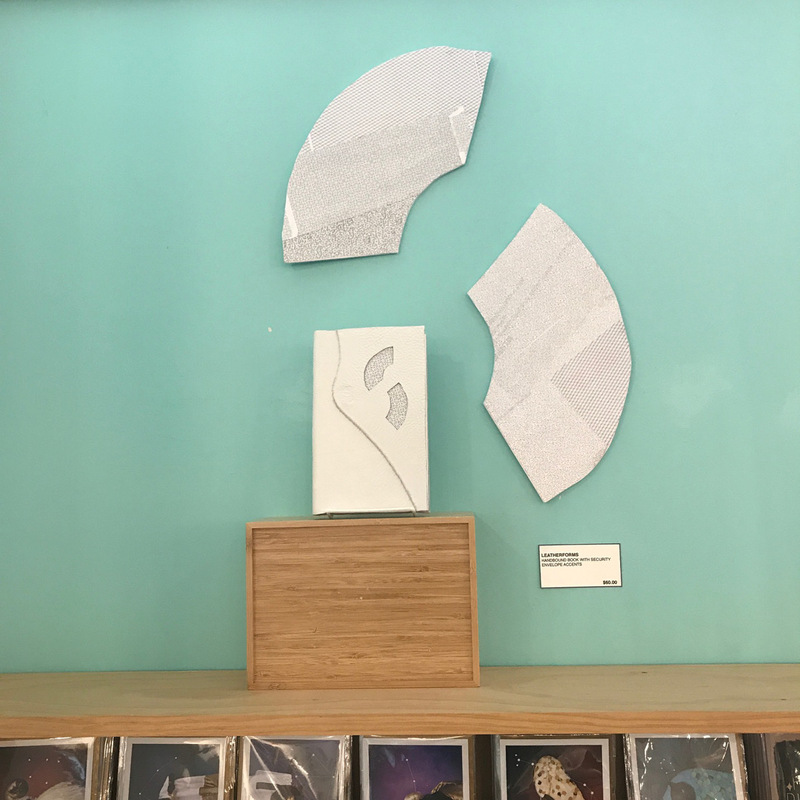 I make books under the name Read Write Books and Homespun is kind enough to feature them in their gallery for the next two months. And don’t forget my zine- a collection of security envelope patterns, because who knew there were so many?